Be the first to share your favorite memory, photo or story of Peggy Jean Harrison. This memorial page is dedicated for family, friends and future generations to celebrate the life of their loved one. 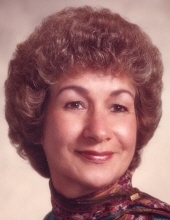 Peggy Jean Harrison Holcombe Lowe, 88, of 3485 Spring Garden Road, Chatham, Va., passed away on Friday, February 8, 2019, at her residence. She was born July 31, 1930, daughter of the late Cora Leonard Harrison and the late George W. Harrison. Mrs. Lowe graduated from cosmetology school in 1949 and later retired from Empire Beauty Salon, which she owned and operated. She was a member of North Main Baptist Church, and previously attended Keen Street Baptist Church for most of her life. She was a member of both Tuscarora Country Club and Ringgold Golf Course. She was a volunteer at Sovah Health (formerly DRMC) and Sylvan Learning Center. In addition to her parents, Mrs. Lowe was predeceased by a sister, Evelyn Harrison Wiles Meadows, two brothers H. Harold Harrison and Vann B. Harrison, and niece, Diane Foust. Funeral services will be held at 2 p.m. Tuesday, February 12, 2019, at Norris Mt. Hermon Chapel with Rev. Fred Unger officiating. Interment will follow at Highland Burial Park. Norris Funeral Services, Inc. & Crematory, Mt. Hermon Chapel, 3995 Franklin Tpke., Danville, Va. is respectfully serving the Lowe family. Online condolences may be made at www.norrisfuneral.com. To send flowers or a remembrance gift to the family of Peggy Jean Harrison Holcombe Lowe, please visit our Tribute Store. "Email Address" would like to share the life celebration of Peggy Jean Harrison Holcombe Lowe. Click on the "link" to go to share a favorite memory or leave a condolence message for the family.